In order to ensure the success of the boiler ignition furnace, the Yanhua Project Department of Ningbo Engineering Company organized the owner, supervision, construction unit, etc. to fully cooperate to overcome the adverse effects brought by the recent strong winds and cooling weather in the northern region, increase the construction strength, and solve the engineering problems. On November 19th, with the last oven gradually extinguished and entered the final natural cooling phase, it marked the success of the CFB boiler oven for the first phase of the Ningbo Power Plant transformation project in Yanhua Eastern District, which lasted seven days and nights. Power generation from production provides a strong guarantee. Before the oven, the company's project department deployed technical backbones with rich experience to thoroughly investigate the hidden dangers together with the parties, confirmed the conditions of the boiler oven again, and ensured the smooth operation of the oven. At the same time, the project department set up an oven operation working group and timely prepared the "Oven Operating Guide" and "Oven Construction Operation Procedures", and coordinated the operation of the construction unit operators, and coordinated the close cooperation of all parties. In the oven process, professionals strictly control the heating rate according to the heating curve of the oven, periodically inspect the oil pipelines, carefully adjust and control the water level of the steam drum, and carefully monitor the expansion of the components such as the furnace, the plenum, the separator, and the return leg. Situation and record temperature in detail. By adjusting the amount of oil and the air distribution of the ovens in various places, the temperature in each place meets the requirements of the predetermined oven curve, thereby ensuring that all the oven operations are successfully completed as planned. After sampling and inspection of the test blocks, all the indicators met the specifications and achieved the expected results. They were unanimously praised by the owners and supervisors. SMT Clean Products advantages: tough and durable, with a high efficiency of water absorption, soft, dust, anti-static performance. Especially for the electronics factory to remove the printing press stencils, circuit boards on the excess solder paste and red plastic , to keep the circuit board spotless, preferably greatly reducing the rejection rate, greatly improve production efficiency and product quality, our company according to the actual use of customers, selected Product width and length. 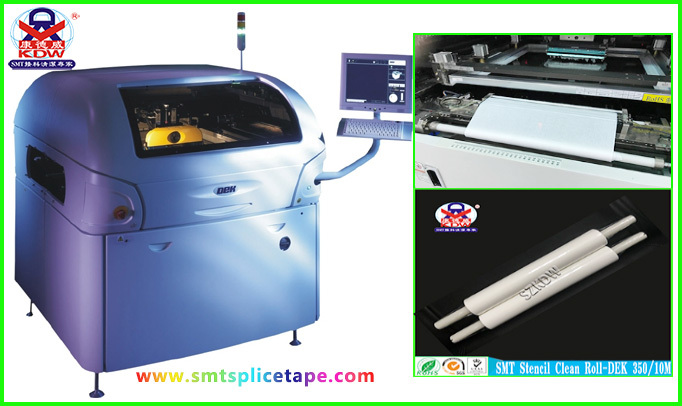 Stencil clean rolls are Suitable for SMT machines of MPM, DEK, JUKI, ERKA, FUJI, Sanyo, Yamaha, Panasonic, KME brands. 01 Paper types: 68g, 65g, 55g, 56g, 60g and so on. 3, We KDW can be customized according to customer requirements processing production.